The Phillies just sent Zach Eflin, one of the biggest surprises and the owner of an 8-4 record and a 3.57 ERA, to the minor leagues while Scott Kingery, one of the biggest disappointments and owner of the third worst OPS (.588) of all qualified MLB players, remains on the big club. It's a move that will cost Eflin roughly $17,000. Eflin's agent sure thinks so. He has a valid point. No matter how things look on paper, Eflin is a person and people do have feelings. What kind of effect will this have on Zach? Does this move bother Eflin to the point that his concentration dissipates in his next few starts? Does it cause a trickle-down effect to the rest of the players? Or does it somehow embolden Eflin to become even more dominant? It's why Odubel Herrera did not start on Opening Day. It's why Kapler lifted Aaron Nola early in his first start. It's why Nick Williams became a bench player earlier this season. It's why position players have pitched 3 games this season. It's also why Kapler pulled three of his best hitters for defense late in a game. Clinging to the slimmest of leads in the National League East, the time for developing players is over. It's time to win some ball games, so it appears, and this move gives the Phillies the best way to achieve that. The logic is that the Phillies can send Eflin down to triple-A and activate him for the double-header on Thursday when teams can add a 26th man. Then, they can option him back to triple-A and activate him again when he next start arrives. Meanwhile, they get to keep both Kingery and Crawford on the roster. “We’ve talked all year about the importance of value at the margins,” Matt Klentak said. “We’re tied for first place. It’s the middle of August. You never know when an extra bench spot or bullpen spot will be the difference in a game. One game might make all the difference. So that’s why we did it." Eflin has a right to be ticked off, but it's hard to argue that the move is the best for the team. Gabe Kapler on Eflin's short-term demotion: �Sometimes one guy takes it on the chin so that 25 guys as a group and as an organization and as a team can prosper.� Hopefully Eflin sees it that way, too. Matt Klentak and Gabe Kapler deserve major points for creativity here. The discussion when Justin Bour arrived surrounded which young infielder, Kingery or Crawford, would have to join the IronPigs for a few months. The Phillies found a way to keep them both with the big club. Eflin handled the situation well according to his manager. “Zach was professional about this through and through,” Kapler said. “He understands that we're going to try to get every marginal advantage through the end of the season that we possibly can, and right now, we have to believe that the division is going to come down to one game. If that's true, having an additional player on our roster that we can use right now is that marginal edge." This might be where Kapler's positivity pays off the most. You better believe he assured Eflin 50 different ways that his faith in the young right-hander has never been as high as it is right now and that they are counting on him down the stretch. Kapler's Phillies have not lost four games in a row this season. 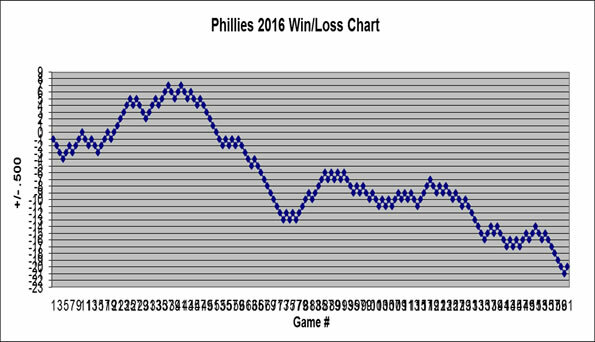 They are 20-11 in one-run games, 9-7 in extra inning games, and outperformed their Pythagorean win total by 3 games. Kapler's style seems to be resonating with the youngest roster in baseball, and his handling of situations just like these is likely a good reason why the Phils are looking down at the rest of the division. This is yet another test for the rookie manager. It still leaves Zach out 17 grand, though.